Just to reiterate some brief details about HSE (Habitation Saint-Étienne), which is located almost dead centre in the middle of Martinique. Although in existence since the early 1800s, its modern history properly began when it was purchased in 1882 by Amédée Aubéry, who combined the sugar factory with a small distillery, and set up a rail line to transport cane more efficiently (even though oxen and people that pulled the railcars, not locomotives). In 1909, the property came into the possession of the Simonnet family who kept it until its decline at the end of the 1980s. The estate was then taken over in 1994 by Yves and José Hayot — owners, it will be recalled, of the Simon distillery, as well as Clement — who relaunched the Saint-Étienne brand using Simon’s creole stills, adding snazzy marketing and expanding markets. 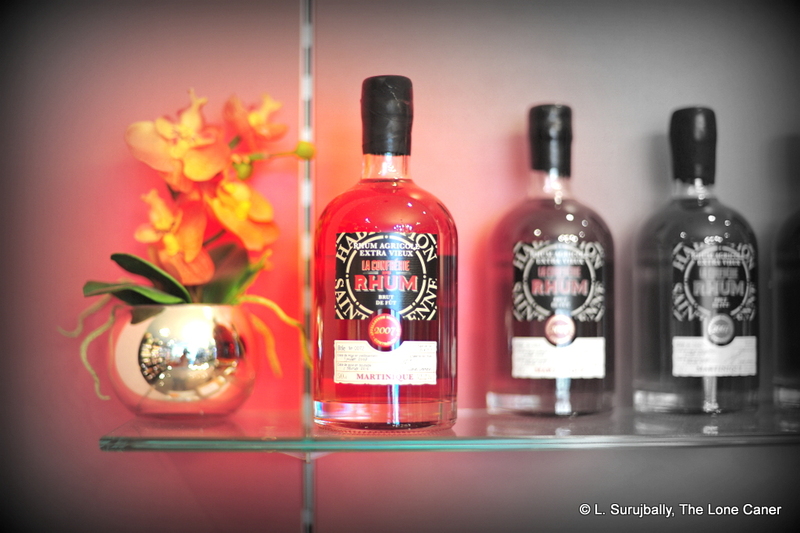 This particular rum, then, comes from a company with a long history and impeccable Martinique pedigree. 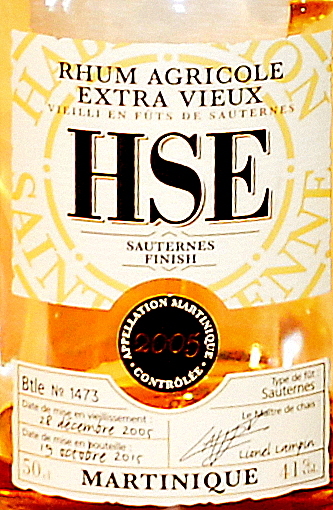 It is an AOC millésimé – a rum issued in relatively small quantities, from the output of a specific year’s production, considered to be a cut above the ordinary (2005 in this case) and finished in Sauternes casks. Given that it is nine years tropical ageing plus another year in the Sauternes casks, I think we could be expected to have a pretty interesting profile — and I wasn’t disappointed (though the strength did give me pause). The initial smells were grassy and wine-y at the same time, a combination of musk and crisp light aromas that melded well. There were green apples, grapes, the tart acidity of cider mixed in with some ginger and cinnamon, a dollop of brine and a few olives, freshly mown wet grass and well-controlled citrus peel behind it all. Well now. That was a pretty nifty nose. How did the palate rate? Very well indeed, I thought. It was a smooth and solid piece of work for its proof point, with clear, firm tastes proceeding in sequence like a conga line – light acetones and flowery notes to begin with, then bubble gum, ripe cherries and plums. The profile proceeded to display some sharpness and herbals — citrus, cider, well-aged sharp cheddar, a touch of apricots and almost-ripe peaches together with softer honey and ginger. What distinguished it and made it succeed, I think, is the delicate balancing act between sweetness and acidity (and a trace of salt), and even the finish – grapes, honey, cane juice and wet grass for the most part – displayed this well assembled character. It impressed the hell out of me, the more so since I walked in expecting so much less. The other day I wrote about a similarly-aged, light rum from Don Q, which I remarked as being somewhat too easy and unchallenging, bottled at a low 40%; and while competently made, simply not something that enthralled me. On that basis, you might believe that I simply disdain any and all such low-proof rums as being ultimately boring, but now consider this 41% agricole from Habitation Saint-Étienne as a response. It emphatically demonstrates to anyone who believes standard strength can only produce standard junk, that a rum can indeed be so relatively weak and still have some real quality squirming in its jock. And with respect to the HSE 2005, that’s a statement I can make with no hesitation at all, and real conviction. This rhum should not be confused with the others in the “Les Finitions du Monde” series (like Chateau La Tour Blanche or Single Malt finish labelled as exactly that), which are also 2005 millesimes, but not bottled in the same month, have other finishes, and different labels. 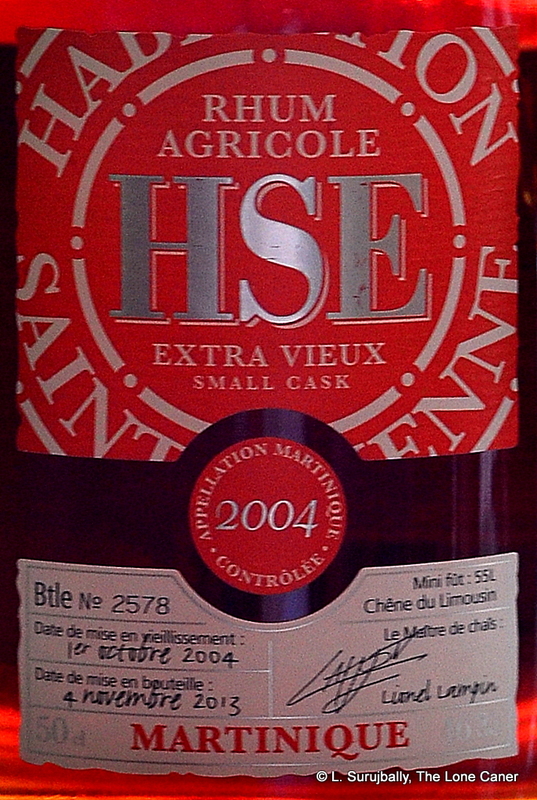 According to Excellence Rhum, this 2005 edition is the successor to the 2003 Millesime which is no longer produced. Nine (9) years aging, plus from 12 months of finishing in Château La Tour Blanche barrels, 1st Cru Classé de Sauternes. White rhums – or blancs – were not products I paid much attention to back in the day, but over the last five years they have continually risen in my estimation, and now I consider them one of the key building blocks of the entire category. Not the lightly-aged, blandly filtered and softly murmuring Spanish-style cocktail staples, you understand – those I regard with relative indifference. No, I mean stuff like the Mexican Paranubes, the Haitian Le Rocher, the Guyanese Superior High Wine, Japanese Nine Leaves Clear, Tahitian Mana’o White or the Surinamese Toucan White, to say nothing of the new crop out of Asia – Samai, Issan, Laodi. What elevates these blancs and all their cousins above the regular run of whites is the way they often maintain a solid connection to the distillate of origin and the land from which they came. They are usually unaged and unfiltered, commonly around 50% or better. Sometimes they’re raw and pestilential and shockingly rude, at other times they’re almost placid, hiding their bright tastes and clear profiles behind a wall of easy and deceptive complexity that takes time to tease out properly (and for both reasons causes them to be occasionally under-appreciated, I think). 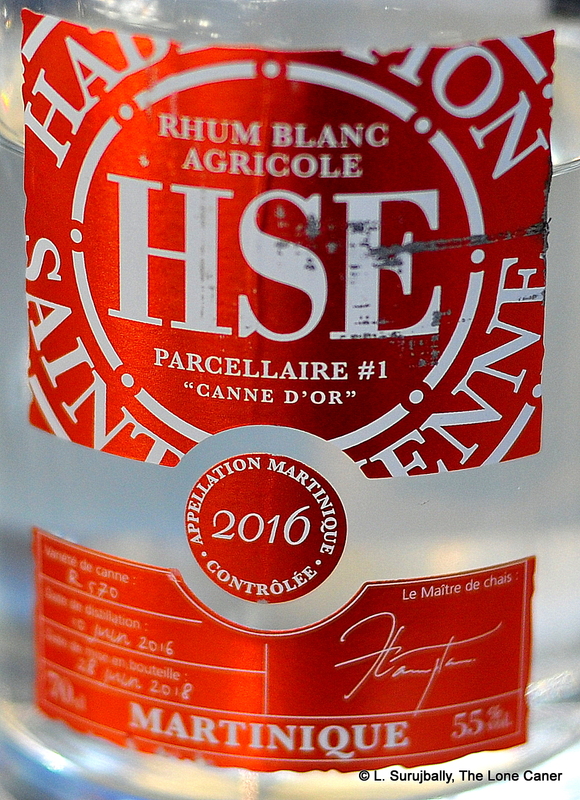 Which brings me to the 55% ABV Habitation Saint-Étienne (HSE) Rhum Blanc Agricole that was distilled in Martinique in 2016 and bottled in 2018 (it rested in steel tanks for the duration and can therefore be seen as unaged). 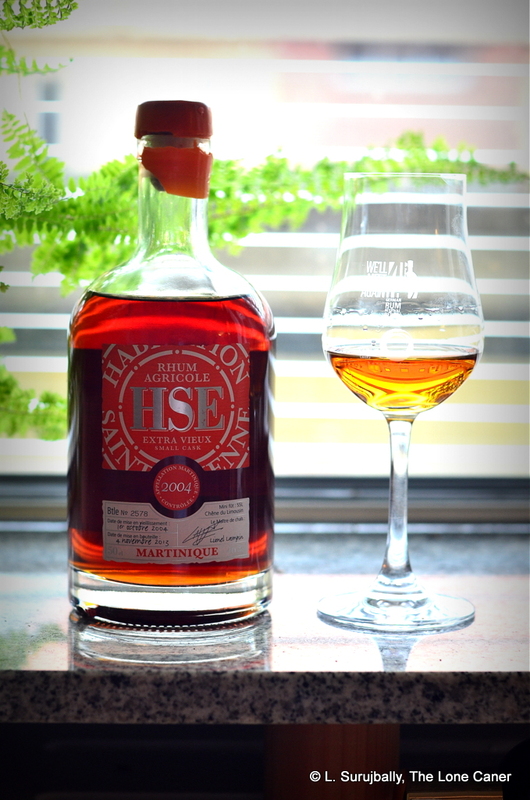 We haven’t talked about HSE for a while, but that doesn’t mean that the Martinique brand has been resting on its laurels, because it continues to produce much good rhum – all AOC compliant – and even taken the whites in a new direction. In this case, perhaps channelling Velier’s Uitvlugt East Field 30 from all those years ago, they selected a special type of sugar cane (canne d’or says the bottle, or “gold cane”, varietal designation R570) not just from their sugar estate in the middle of Martinique, but from a specific part of it – the Verger and Coulon plots of land, issued as a rhum they call Parcellaire #1. So it’s a sort of micro version of HSE as a whole, showcasing a very small part of its terroire. Aside from HSE, Longueteau, or the new kid on the island block — A1710 and their white La Perle — such atomized drilldowns into smaller subunits of an estate are almost unknown…but they are intriguing to say the least (even though it may all just be cool marketing – I like to think otherwise). Fortunately the way it smelled and tasted skated over such concerns. The nose, for example, was quite fragrant, starting off with slightly rotten fruits (bananas), rubber, sawdust, set to a background of soft wax candle, all very restrained. Overall it was a little sweet and relaxed, and as it opened, additional notes of nuts, cereals, almonds and nougat came forward. There was also a hint of olives, brine, pineapple, sweet green peas and ripe oranges in an excellent melange that combined themselves very well, without any single aspect being particularly dominant. Blanc agricoles’ tastes are usually quite distinct, showing variation only in the details. This one was slightly different — very smooth, very light, the usual herbs and light citrus and grasses starting things off, just less crisp than one might be expecting. This seemed to be kind of nothing-in particular, but hold on a bit — the other, more complex flavours started to creep out. Dill, sugar water, olive oil, cucumbers, watermelon, light pimentos and gherkins, all sweet enough not to be off-putting, salty/sour enough for some character. I thought it was really quite tasty, giving aged offerings from the same house some serious competition, and finishing things off with a fade that provided last memories of sweet sugar water, light delicate notes of cumin and watermelon and papaya. Does that all work? Are the specific plots of origin really that clear? I suggest that as a showcase for such a tiny bit of land, for the general rum drinker, not really. The differences between the regular run of blancs from HSE and this one can be chalked up to miniscule divergences deriving from batch variation rather than anything so refined. Admittedly though, I’m not a professional sommelier, and lack the experience such people bring to sensing gradations of wine hailing from neighboring vinyards in France – so someone with a more finely tuned snoot may take more away from this than I did. But I liked it. I liked it a lot. Above, I wrote that really good whites are either cheerfully rude or deceptively polite: this one tilts slightly more towards the latter while still remembering its objurgatory antecedents. 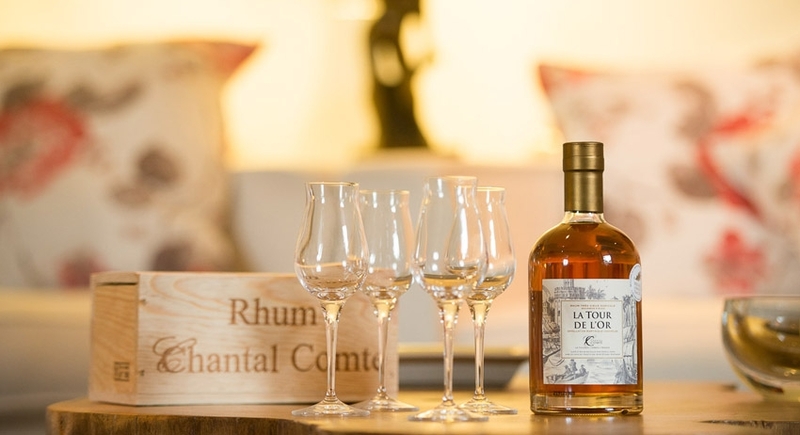 It’s a enormously drinkable dram, near perfect strength, with wonderfully delicate and strong tastes mixing up both sweet and salt in a terrific white rhum. You could drink it alone or mix it as you please, and you’d enjoy it either way, with nothing but a nod of appreciation for what HSE have achieved here with such seeming effortlessness. And for its price? This thing may just be an undiscovered steal. The Habitation Saint-Étienne is located almost dead centre in the middle of Martinique. Although in existence since the early 1800s, its modern history properly began when it was purchased in 1882 by Amédée Aubéry, an energetic man who combined the sugar factory with a small distillery, and set up a rail line to transport cane more efficiently (even though oxen and people that pulled the railcars, not locomotives). In 1909, the property came into the possession of the Simonnet family who kept it until its decline at the end of the 1980s. The estate was then taken over in 1994 by Yves and José Hayot — owners, it will be recalled, of the Simon distillery, as well as Clement — who relaunched the Saint-Étienne brand using Simon’s creole stills. Particular attention should be paid to the “small cask” moniker in the title here, because what it means is that this sterling and near-outstanding little rum was matured in small French Limousin oak casks called “octaves” that hold fifty-five liters, not a couple hundred or more as in the “standard” (and it not a single cask, by the way). Combine both the tropical maturation and the smaller cask size, and what we can expect with such a product, then, is a rum of some intensity of flavour. Which it is, and it delivers, in spades. In the blind tasting with a bunch of other Martinique and Guadeloupe agricoles — Dillon 12 YO 45%, Bielle 2007 7 YO 57.3%, Rhum Rhum Liberation 2015 Integrale and another six (or was that seven?) – this one edged them all out by just a smidgen and that’s quite an achievement when you consider what it was being rated against. If you feel these remarks are unjustifiably over-enthusiastic, feel free to dive right in and just smell this luscious 46% copper-amber coloured agricole. It was light and flowery, much more so than any of the others; acetones and nail polish mingled happily with the sweet vanilla and chocolaty-coffee aromas of a busy day at the confectioner’s, and there were creamy scents of milk chocolate, truffles, cocoa, before these bowed and took their place at the rear, allowing gently tart fruity notes to edge forward – red currants, red guavas, freshly cut apples, sugar cane sap and pears for the most part. These all emerged gradually and in no way interfered with each other, combining to produce a very aromatic, if gentle, nose — warmly supportive rather than bitingly sarcastic, so to speak. It was also quite excellent to taste. It had a lovely mélange of gapes, nutmeg and cinnamon to start off with and then presented bananas and coconut, vanilla ice cream and some caramel; gradually a robust background of salty cheddar, ginger, orange peel became more noticeable. Here the oak became quite distinct, though thankfully not entirely overwhelming – it was enough to make itself known with emphasis, that’s all, and perhaps even that might be a whiff too much. With water florals and ripe apples and pears and grapes again, and edging around it all was a nice burnt sugar taste that reminded me of sugar cane fields set to flame in the cutting season (something like the Clement Tres Vieux XO). The finish was all right, somewhat short, but warm and comfortable, with light cider, chocolate and creamy notes and a touch of brine. All in all, a really good dram – I really enjoyed this one. The balance of tastes matched the available strength pretty well and neither overcompensated for flaws in the other. I’m not much of a whisky drinker (to the annoyance of many), but there was something quite bourbon-y about the HSE Small Cask – maybe I should try a few more of those just to see how the comparison holds up. Probably not – there are far too many rums and rhums out there I haven’t tried yet, and products like this one are a good reason to keep up the voyage of discovery. So why pay extra coin for whisky when rums are so much cheaper and often just as good (I always say better) in quality, right? 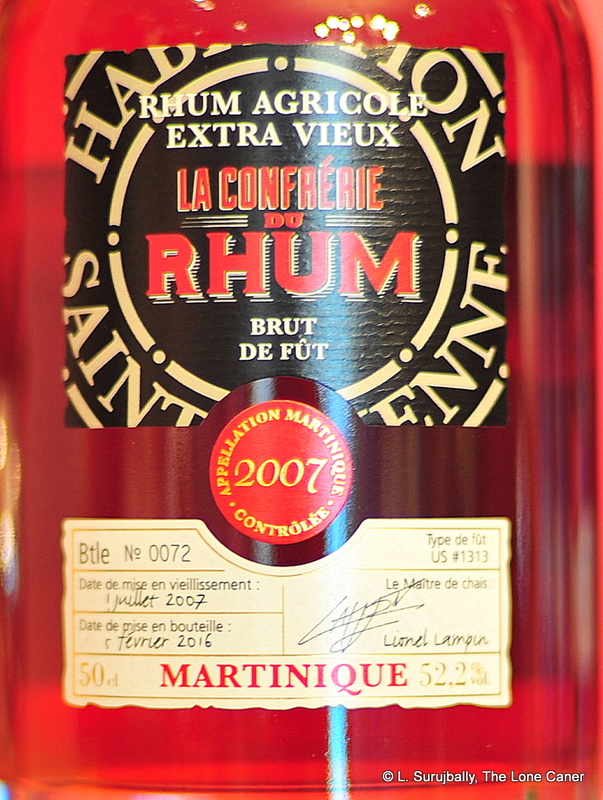 For those who are into the details, the rum is an AOC-certified Martinique rhum made from cane juice, distilled on a creole still in October 2004, bottled November 2013 (I bought mine in early 2016), and nine years old. Unfortunately there is no detail regarding the outturn, though my bottle was numbered #2578, so feel free to guess away. With numbers like that, it would appear that there are still many more bottles available – this is not one of those sixty-bottle runs that you can’t get ten days after it hits the market: and that’s all to the good, because even at its price and for a scrawny 500ml, it’s a great-tasting rhum, and though it’s “only” 46%, you’re getting quite a little pocket-Hercules of taste in your glass when you try it and does the brand no dishonour whatsoever. 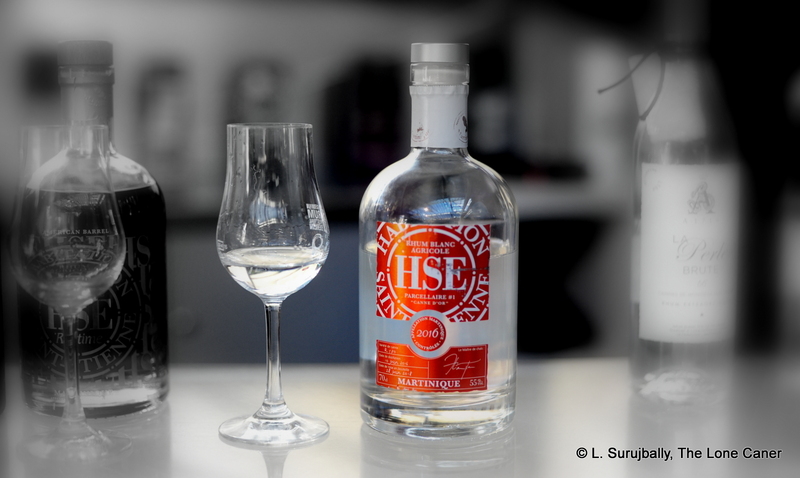 Some background notes on Habitation St. Etienne can be found on the review for the HSE 2007 Millesime issued with/by la Confrerie du Rhum – that one was also very good. 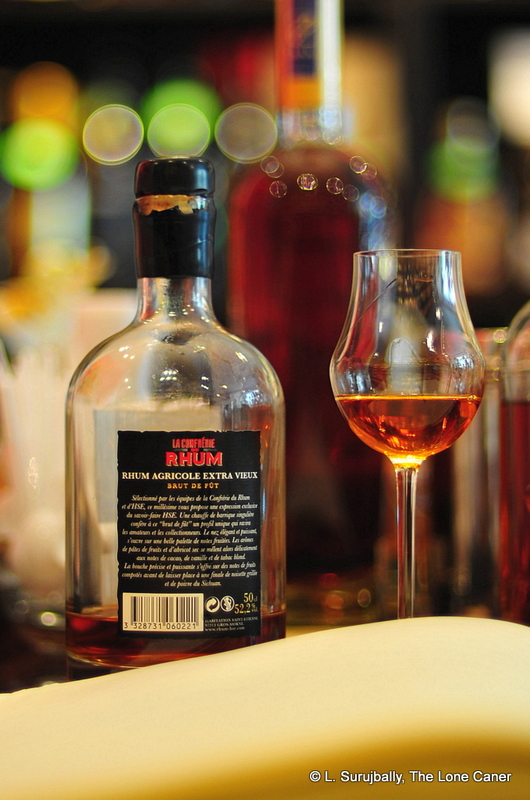 A lovely, supple rhum from the French island. La Confrérie du Rhum’s Martinique Extra Vieux (as labelled), a 2007 millésime rhum bottled at a forceful 52.2% had darker notes reminding me of the Damoiseau 1989, until it went off on its own path and in its own way, which makes perfect sense since it’s actually from Habitation St Etienne. And while I have not had enough of those to make any kind of statement, after trying this one I bought a few more just to see whether the quality kept pace…because La Confrérie’s rhum was quite a lovely piece of work. The Habitation Saint-Étienne is located almost dead centre in the middle of Martinique. Although in existence since the early 1800s, its modern history properly began when it was purchased in 1882 by Amédée Aubéry, an energetic man who combined the sugar factory with a small distillery, and set up a rail line to transport cane more efficiently (even though oxen and people that pulled the railcars, not locomotives). In 1909, the property came into the possession of the Simonnet family who kept it until its decline at the end of the 1980s. The estate was then taken over in 1994 by Yves and José Hayot — owners, it will be recalled, of the Simon distillery, as well as Clement — who relaunched the Saint-Étienne brand using Simon’s creole stills, adding snazzy marketing and expanding markets. The Brotherhood itself is an odd sort of organization, since it exists primarily on Facebook. Running the show are Benoît Bail, a sort of cheerfully roving rum junkie without an actual title but with an awesome set of tats and love of rum who currently resides in Germany, and Jerry Gitany who moonlights at Christian de Montaguère’s shop in Paris; among various other rum promotional activities, they dabble in importation of spirits, and starting in 2015 they were first approached to be part of a co-branding exercise (they are not precisely independent bottlers). 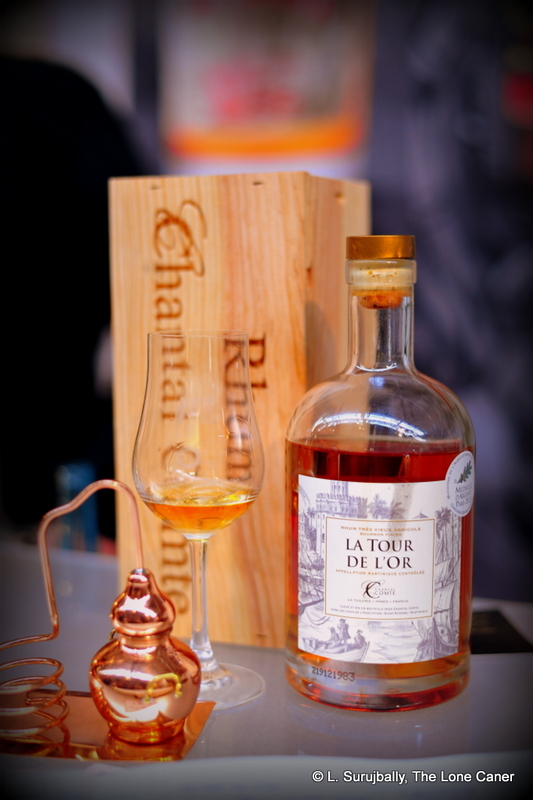 What this means in practice is that they work with a distillery to chose the rum (a cask or two), put La Confrérie’s logo on the label, and designate which shops get to sell it to the final consumers, and work to promote it afterwards. So far they’ve co-branded four expressions: Les Ti’Arrangé de Céd (March 2015), Longueteau (June 2015), La Favorite (December 2015) and this one. The story of this particular rhum started during one of Jerry’s regular visits to HSE, when Cyrille Lawson, the commercial director, remarked, “Jerry, we want to do a cuvée with La Confrérie.” “Sure,” Jerry said “But you have to do something that you’ve never done before.” And Cyrille, probably relieved not to be asked to go base-jumping in a pink suit, agreed to come up with something good. One year later, Benoît and Jerry were at HSE picking and chosing among six different samples, the final result being this first full proof 52.2% beefcake. It was distilled in a creole column still, then aged in an American oak barrel between July 2007 and February 2016, had no additives, fully AOC compliant, and turned out at a very nice 800 bottles. It turned up for sale just in time for three hundred to be snapped up at the 2016 Paris rumfest, and for me to walk into the establishment two months later, see it and want to check it out. The aromas of the gold-amber rhum were excellent: the initial attack was all about anise, fruits, raisins, coffee and some red wine (I’m not good enough to tell you which) – this was the part that reminded me of the Damoiseaus. But then it went its own way, adding orange zest, more coffee, and some molasses (what was that doing here? ), with just the slightest bit of vegetals, lemongrass and sugar cane juice. They were crisp notes that scattered like bright jewels on a field of black velvet, somehow vanishing the moment I came to grips with them, like raindrops in moonlight. The taste, on the other hand, did not begin auspiciously – I actually thought it somewhat uncouth and uncoordinated, being sharp and spicy and seemingly harsh, but then it laughed, apologized and developed into an amazingly beautiful profile: honey, dill, candied oranges and coffee, bound tightly together by the clear hot firmness of very strong black tea. And that was just the beginning: as it relaxed and opened up (and with some water), sugar cane juice and herbals and grasses came up from behind to become more assertive (though not dominating). Again there as that odd caramel and molasses backtaste, and then came one I’m at a loss to explain except to say trust me, it was there: the scent of salt beef in a tub, hold the beef (I am not making this up, honest). It all finishing up with a lovely fade, long and warm, dry, not overly tannic, with some smoke and light dusty haylofts mixed in with chocolate, juice, zest and grass. I mean, guys, I had this thing in my glass for almost two hours while I went back and forth in that shop, and what I’m describing was real – the rhum has a phenomenal palate…less sharp than might be expected for 52.2%, and yet quite distinct and strong, a veritable smorgasbord of cooperating tastes. Years ago when studying the games of go-masters, I remember reading that one of them lost not when he played the most promising or “proper” moves, but when following lines of play which resulted in an elegance and purity of his game which overwhelmed his desire to win. It was all about the pleasing arrangement of stones on the board, you see: the beauty. The ending was, in its own way, superfluous. Irrelevant. The pattern was everything. A sample straight from the bottle, one of several that Jerry Gitany let me try in Christian’s shop in Paris in early 2016. You could argue that I was positively influenced by it being a freebie, but since I picked it and he didn’t, and since a fair bit of my coin had just vanished into his till, I chose to believe otherwise. The dates on the label make it clear this is an eight year old. Benoît confirms it is a true millésime. As an aside, so Jerry informs me, HSE was so happy with this rhum that they asked La Confrérie to collaborate on a second batch, supposedly to be even better. It will be delivered by the end of 2016 (November or December). An agricole that bends the rules just enough to be original, without dishonouring its antecedents. What a remarkable rhum. In between the larger and more well known independent bottlers lurk smaller operators pursuing their own vision. Some, like Old Man Spirits, or Delicana, fight the good fight without undue recognition or perhaps even real commercial success. Others seem to find a more workable middle road. Chantal Comte is one of these, an eponymous company run by a bright and vivacious lady who Cyril of DuRhum interviewed earlier in 2015. I first saw some of her products in 2014, bought some more out of Switzerland, and now keep an eye out for anything else the lady makes, because, almost alone among the independent bottlers, her company specializes in agricoles and pays no mind to the larger market of molasses based rums. That gives her rhums a focus that seems to pay huge dividends, at the price of being relatively unknown and relegated almost to bit-player status in the broader rum community. Born in Morocco into a family with West Indian connections, Ms. Comte started out as a winemaker in the early 1980s, in Nimes. Martinique influenced her interest in rhum, and through the decades she was mentored by two major players in the agricole world, André Depaz of the Mount Pelee plantation, and Paul Hayot (the Hayot family company took over the Clement distillery, you will recall). In the mid eighties this interest developed to the point where she began blending and bottling some of Depaz’s rhums (with André’s encouragement) and stuck with a philosophy of blending the original vintages, sourced from all over the French West Indies, and bottled at natural strength…whatever was felt to be appropriate to the final expression. What I had here, then, was a bourbon finished 46.5% amber-coloured AOC Martinique rhum…the questions for me were, which plantation and how old, because Martinique has quite a few different agricole makers and Ms. Comte bottles several. But then the fine print on the label showed it was L’Habitation Saint-Etienne, so mystery solved. How old? No idea. 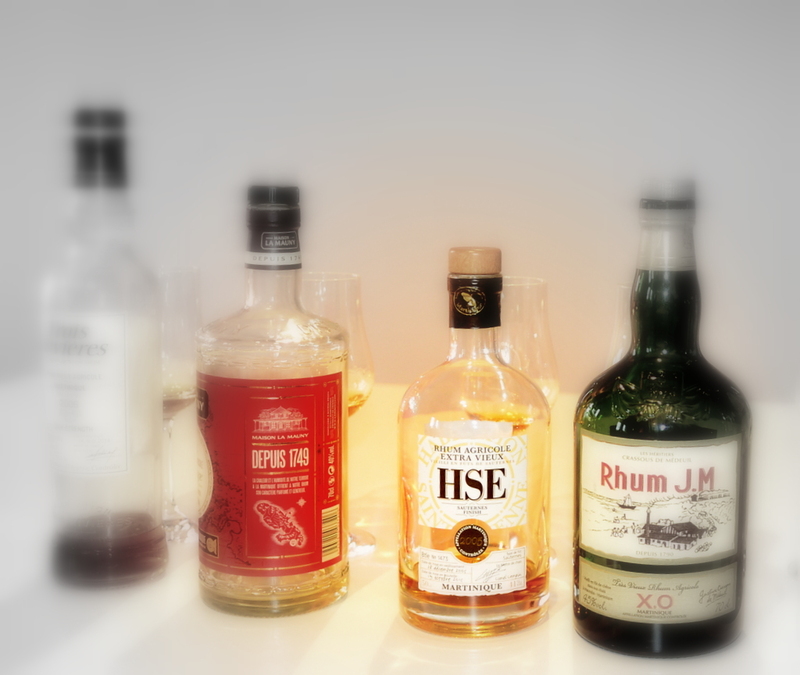 The rhum is a blend, and comprises several different vintages from HSE: there is no detail on whether the blend was itself aged or not, and how long the bourbon finishing regimen was. It was probably an XO, six years old at least, and honestly, I felt it was likely older than that. On the other hand, I was informed that all vintages are derived from small creole column-still distillates (much like most of the French island agricoles) aged in limousin oak before final transferrence to bourbon barrels for the final finishing and blend. No additions, no filtration, and the AOC designation remains. These days I don’t write much on presentation unless there’s something intriguing (or irritating – cheap corks and tinfoil caps are pet bugbears of mine). Still, I’d like to comment on the beefy barroom bottle, similar to Rum Nation’s, as well as the wooden box, which certainly gets my nod of approval, given the thing costs over a hundred euros – I’ve never discarded my feeling that when one pays a fair bit of coin, then one is entitled to a fair bit of bling, and here the delivery is just fine. (Note to wife: makes a great gift at Christmas). For a rum this light in colour, it was also pleasantly deep (though not heavy a la Port Mourant or Caroni, it was too fresh and clear for that) – somewhat stinging initially, even harsh, so watch out. And also, be warned…there’s an opening salvo of cordite and firecrackers in here, a gun-oil kind of metallic note; not strong enough to overwhelm subtler tastes that were waiting in the wings, and they died away quickly…but it did make my hair curl for a moment. More traditional tastes followed in swift, balanced unison, trip-trapping across the palate – semi-sweet fresh fruit, lemon-grass, ripe mangos, papaya, vanilla, ginger (very faint). It began to trend towards driness as it trailed off, and the finish just confirmed that – fairly long, heated, arid, and last flavours of grass and mild zest to round things off. My experience with independent bottlers is that they usually come to rum after dabbling in the obscure Scottish drink and only later discovering the True Faith. Ms. Comte took a different path, starting out with wine (she owns the Château de la Tuilerie which she inherited from her father, and until recently, ran the winery there). It’s debatable what specific skills can be transferred from one spirit to another: yet, if other editions put out by her company are on par with or better than this rather interesting and remarkable rhum, all I can say is that I hope more wine makers move over to rhums, and quickly. Big hat tip to Cyril of DuRhum, who not only wrote the initial interview with Ms. Comte, but proofed my initial post.